You are going to Watch One Piece Episode 445 English dubbed online free episodes with HQ / high quality. Stream Anime One Piece Episode 445 Online English dub The Dangerous Encounter! Blackbeard and Shiryu of the Rain! The Demon Guards arrive and overpower many of the prisoners, but Luffy, Jimbei and Crocodile defeat them in a single attack each. 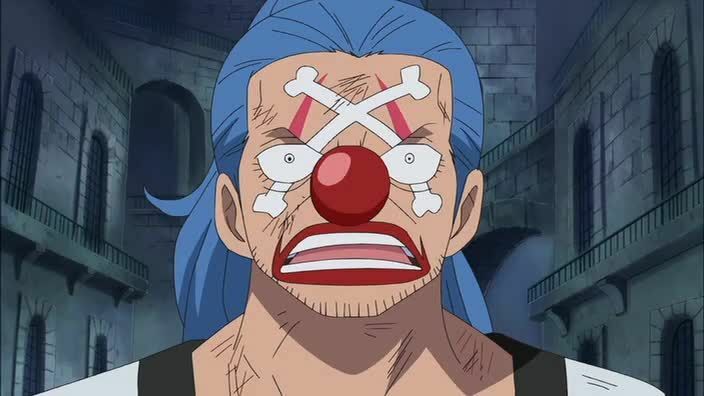 Buggy and Mr. 3 are trapped on Level 2 by a barrier made from Magellan’s poison. On Level 1, Shiryu encounters Blackbeard, who is forcing his way into the prison, and after a conversation, Blackbeard proceeds onward. Hannyabal is ordered to hold off the prisoners until Magellan reaches Level 4. Sadie attacks the prisoners but Ivankov transforms into a woman to fight with her and allow Luffy to proceed. Luffy then encounters Hannyabal, who arrives prepared to fight him.